Choosing a programming language is one of the most crucial steps in your mobile application development lifecycle that should be resolved at the initial stage of the project. As the language plays a critical role in determining many essential flows and procedures in the project, making the right decision is imperative. The backend takes care of the server-side which is not visible to the user, but it is the engine that runs your application. It’s often described as the “determinant of a good front-end experience for you the user”. When it comes to back-end development, both NodeJS and Python play a leading role; both programming languages are designed to help you achieve the same goals. Thus it is difficult to choose between the two. Here we give you an extensive comparison between them. What is Python and What is Node.JS? Python in simple terms is “object-oriented, high-level programming language with integrated dynamic semantics primarily for web and app development”. It is a highly productive, clean server-side scripting language with multi-purpose use and perfect for developing greatly portable mobile and web applications. Moreover, it has distinctive multi-programming paradigm support that includes an approach that is imperative, object-oriented, functional and procedural styles. The key difference between Python vs Node.JS means that when you code in Node.JS you use the same language for both – the frontend and the backend. Here is a non-biased breakdown of both choices in regards to each aspect of back-end development. Performance is the most crucial aspect we look from a programming tool. This is what determines the speed of the application which is dependent on how fast your code is executed. Comparing Node.JS and Python performance wise, it’s clear that Node.JS is significantly faster. This is because Node.JS is based on Chrome’s V8 which is a very fast and dynamic engine. For this reason, the speed factor is also favorable to Node.JS in comparison to Python. Thus it makes a great choice for developing a real-time application, like – apps that involve chat function. Python is also highly unsuitable for memory intensive processes- as it is interpreted creating an initial performance drop in comparison to Java. Therefore, it is not preferable for developing solutions that use heavy 3D graphics. When it comes to scalability, we need to understand how effective the language is in handling large user traffic and how they can be handled using the minimum server. Scalability is very important in applications that are content-heavy and those serving various new users via mobile and desktop interfaces. Node.JS though single threaded, has an event-based asynchronous architecture and non-blocking I/O that helps it to make the most of the CPU and computer memory. The asynchronous nature allows Node.JS servers to process more concurrent requests as compared to the multi-threaded servers. The I/O doesn’t block program execution under I/O heavy workloads which helps Node.JS application runtime performance. These factors make Node.JS servers faster and productive. This feature ensures smooth Node.JS scalability within simple web apps, but the development of complex apps with a lot of concurrent processes need in-depth knowledge, attention and careful research. Python, instead, does not support asynchronous programming by default compared to Node.JS. Although, it does support coroutines with which asynchronous processing can be easily attained. Thus, even if its architecture may not be seen as scalable as Node.JS, it has the tools with which scalability can be reached. Python also scales well in code complexity, it makes code complex projects easier, wherein Node.JS would potentially pose difficulty due to its asynchronous programming. Python is one of the most multi-faceted languages and adapts well to be used in ERP development, web development as well as Artificial Intelligence/ Machine Learning or Data Analytics development etc. Verdict – Both Node.JS and Python are neck to neck in terms of flexibility and utility. Both Node.JS and Python are good with throwing and catching the errors that occur in code implementation. Though, the general notion is that doing the same is easier with Python and takes less time to fix errors. CONCLUSION- PYTHON OR NODE.JS –WHICH FARES BETTER? 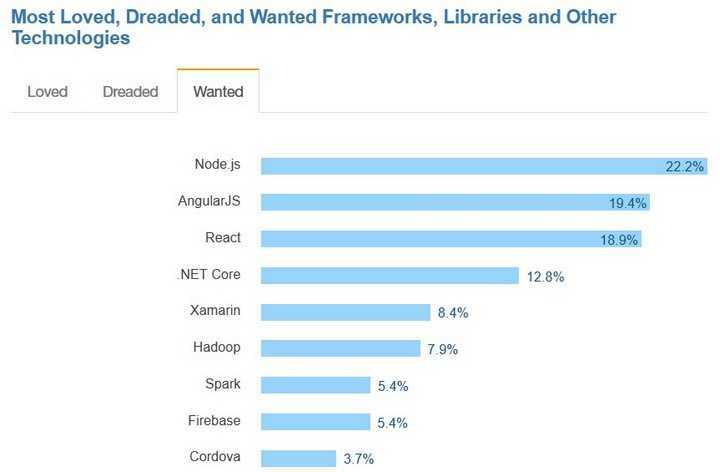 It is clear to see that both Node.JS and Python have highly earned their place as the top ‘wanted’ languages in software development- as the recent StackOverflow survey depicts. Haven seen positive points of each language, it can be concluded that both Node.JS and Python are ideal depending upon the application developed. The choice of main technology that supports your project should be dependent on factors such as – application type, industry sector, performance requirements, developers experience, and so on. Both of their advantages determine the areas where they shine. Node.JS, for its outstanding performance and speed, is perfect for creating applications that feature messaging or applications such as content-management solutions, e-commerce apps, heavy-load apps etc. In fact, LinkedIn, the biggest professional social network app and eBay, the global e-commerce platform are Node.JS use cases. Meanwhile, Python which has more stability, consistency and ease of use is a popular choice for creating scientific apps, government projects and big-data solutions. United Space Alliance, the company NASA contracted to support its shuttle program chose Python to develop the software Nasa needed.